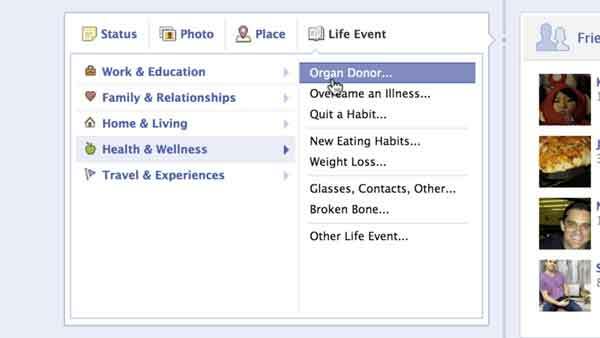 Would you share your organ donor status on Facebook? You share what you’re making for dinner, how your garden grows, where you’re going on vacation…But what about your organs? Mark Zuckerberg is hoping you will. On “Good Morning America” on Tuesday, Zuckerberg and company Chief Operating Officer Sheryl Sandberg announced that Facebook is letting those U.S.- and U.K.-based users add whether they’re an organ donor to their timelines and the story behind the decision to become one. There’s also a link to the official donor registry for those inspired to become a donor. The wait list can range from six to eight years, depending on the organ needed. In the place where you normally update your status, there is now a "Life Event" section.